Disclosure: This is a compensated post in collaboration with Stemilt and their Pairology app. As usual all opinions are my own. Thank you Stemilt for making NJB awesomeness possible. Did you read that right? Yes, you totally read that right, I used Brie in frosting for a cake with apples. It makes perfect sense, and it tastes like a dream come true! You can enter to win $400 in prizes on Stemilt! It was super fun using the Pairology app from Stemilt, and made this recipe even more interesting to develop. My favorite apples for eating, cooking, and baking are Honeycrisp. They are a great versatile variety. The firm, crisp texture, and natural sweetness lend themselves effortlessly to cooking and baking. What’s even better, they are perfectly paired with cheese. This was the fun part, I really wanted to incorporate an unusual cheese into a frosting, so when the Brie popped up as a pair, I was super happy! That’s when I knew this cake was born. 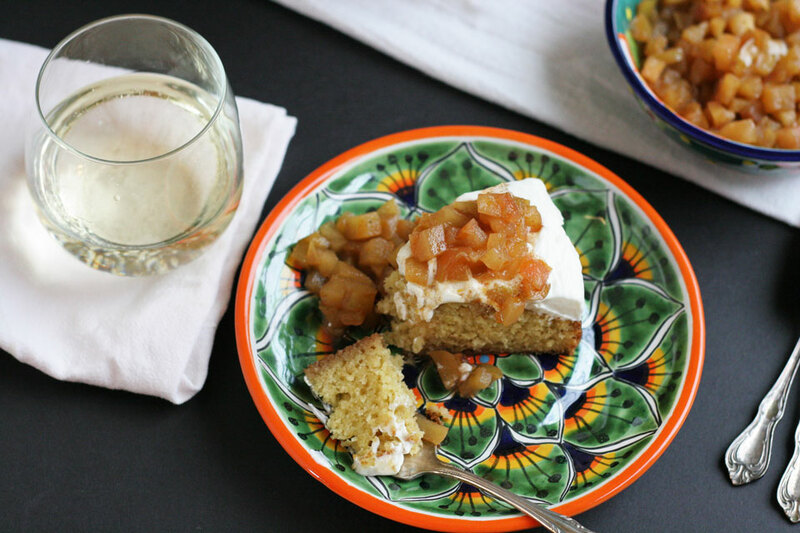 Apples, cheese, and wine have been pairing friends for a long time, why not put them to use in a cake? I was just as elated when I saw the next pairing, Moscato. Crisp, cool, and picking a lightly sweet variety brings this dessert together just how I wanted. 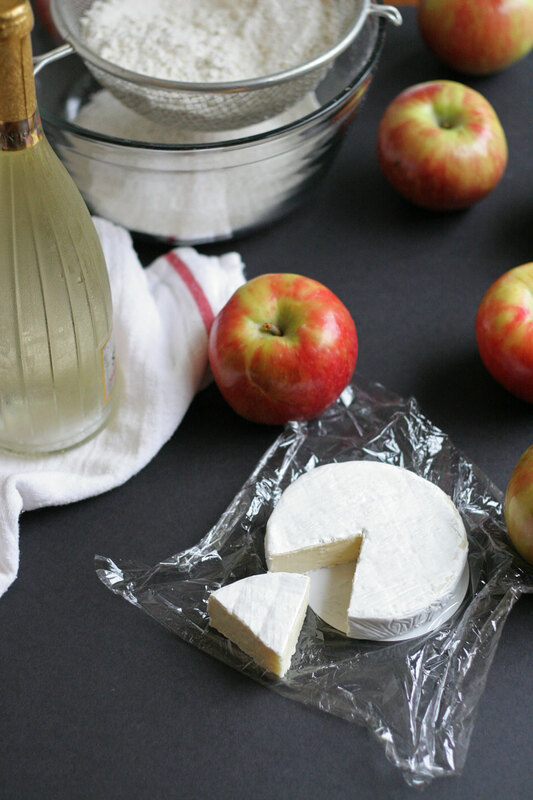 I love a good bubbly Moscato, and it loves Brie and apples, so this worked out for all involved. Matches made in Pairology dessert heaven! Recipes like this and the challenges of putting flavors together for a sweet or savory dish for people to make or bake is what keeps me inspired, and motivated as a food blogger. Teaching people how to cook and bake, or giving the seasoned home cook a tip or trick to make things work smoothly make me silly happy. It comes down to the simplicity of helping people in the kitchen, and seeing them light up when they have made something delicious because of the help I have given, that is what makes my work as a food blogger worth every moment. Check out Stemilt’s awesome Pairology app, enter to win $400 in prizes, and join us for a Twitter party hosted by Jen from Savory Simple! It will all be great fun. 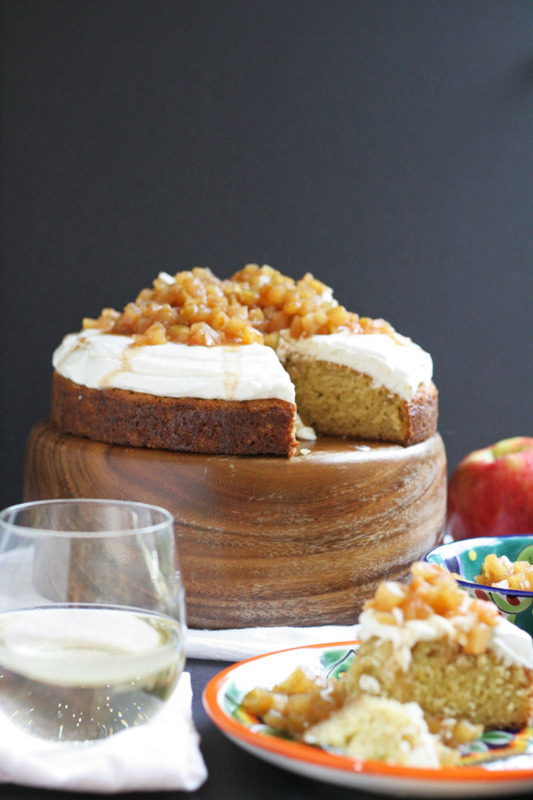 Buttermilk Cake, Brie Whipped Frosting, with Spiced Apples for the win! 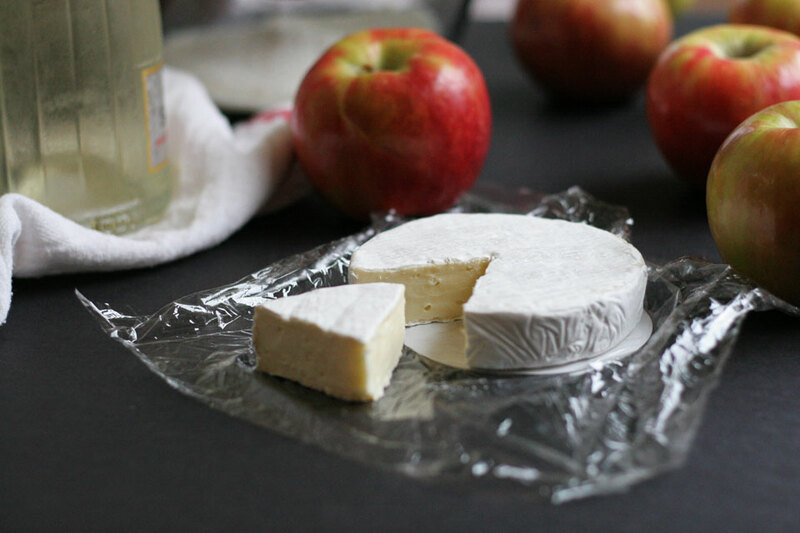 Note for Brie purchase: Choose the softest variety you can find, it will be much easier to whip into the frosting the softer the cheese. Place rack in center of oven, preheat oven 350 degrees. Lightly oil a 9 inch cake pan, using the grapeseed oil. 1. In a large bowl, combine flour, sugar, baking powder, baking soda, and salt, whisk to combine. In a medium bowl. combine buttermilk, grapeseed oil, vanilla extract, and eggs, whisk to combine using a fork. Pour buttermilk/oil mixture into flour. Using a spatula, gently combine, do not over mix. Pour batter into a lightly oiled 9 inch cake pan. Place in oven and bake for 40-45 minutes. Remove from oven, and remove from cake pan. Allow to cool on a wire rack for minimum 1 hour before assembly. 2. While cake is baking, work on compote. Place chopped apples, salt, cinnamon, cardamon, nutmeg, salt, zest, and juice to a medium sauce pot. Bring to a light boil over medium heat, reduce heat to medium low, and allow simmer for 5 minutes covered. Uncover and cook for another 15-20 minutes. Remove from heat and allow to cool. 3. In a stand mixer fitted with whisk attachment, add brie and whip for 5 minutes until light and fluffy. Add heavy cream, and whip for 3 minutes, until medium-stiff peaks are formed. Add sugar and whip for 1 minute, until combined. Place cooled cake on a large plate. Using a large spatula, spread the frosting on the cake, just covering the top, not sides. 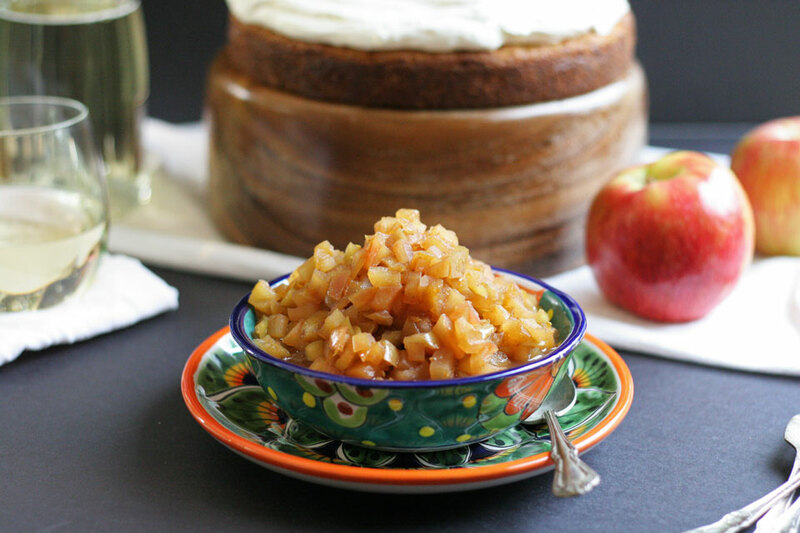 Using a large ladle or spoon, scoop spiced apple compote on center of cake over frosting. Make ahead: Make each component up to 1 day in advance, assemble before serving. Leftovers should be stored in an airtight container and used within 1 day. Serve with champagne or my favorite, Moscato! Brie Whipped Frosting?!?! OMGGGGG! I have to try this! Lol! Yes, pleassse try it, I fell in love with it :). Thank you! You are freaking brilliant. That is all. I love that Pairology tool. It’s so fun to play with! You are the SWEETEST!!!!! Thank you so very much :). It was pretty tasty :). Thank you, Lori! This is the COOLEST idea. I love brie to death (and honeycrisp) but never would have though of a dessert like this! You are awesome! Thank you so much. Learn something new everyday! Never thought of using Brie as a frosting. I have got to try this sometime! Thank you, Connie! Totally worth trying :). What a unique idea! I had never heard of this app before, but it seems like it could be such a fun idea! t is super fun to play with, Erin. Thank you! creative genius – I love this idea! What a fun cake and topping. I’ve never heard of that app before, but I think it’s cool that it paired all that stuff up for you. And, I think you did an awesome job with being creative with the pairing as well. The cake looks delicious. Thank you so much, I appreciate it :). I really wanted to start with Brie, so it evolved from there and worked out well! Brie Frosting!?!! I’m dying, I’m dying. I must try this frosting! Lol!!! Oh pleaseee do :). Thank you! Totally unusual, totally worth making.